Amanda’s note: Here is another great recipe from Ramya Venkateshwaran, writing on a coconut farm in India. 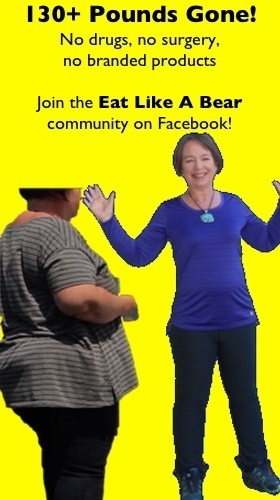 (Her website is WildTurmeric.net.) I asked her to write about her method for making coconut milk from fresh coconuts and I am tickled to learn from her experience. I doubt I’ll ever land a fresh coconut to meet her standard, but I love the window into life on a coconut farm nonetheless. You will too. 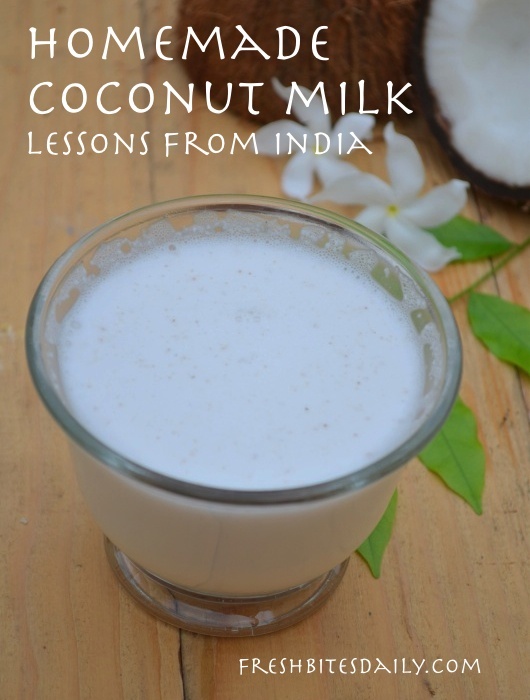 I have been making coconut milk for many years now, almost daily. When Amanda asked me to write about coconut milk making, I was more than happy. Most of our traditional dishes have coconut milk in them, so I extract coconut milk every day. We use coconut milk for our gravies, rice dishes, and in our sweet dishes. Coconut milk is very soothing on the stomach and if you suffer from stomach burn, try this: To your coconut milk, add a bit of sugar to sweeten and slightly warm it in low fire, stirring all the while. Once the sugar has melted, add cardamom powder. This drink is very tasty and is a good home remedy for stomach burns. You can either drink it like that or serve it with boiled fine rice noodles. For making coconut milk, selecting the coconuts is a very important first step. If we use dry coconuts, the coconut milk be very oily. Since I live on a coconut farm, I always collect fresh coconuts from the farm for our use. Farm helpers peel the outer green layer of the coconut, usually all the coconuts sold in the shops have the outer most covering removed. 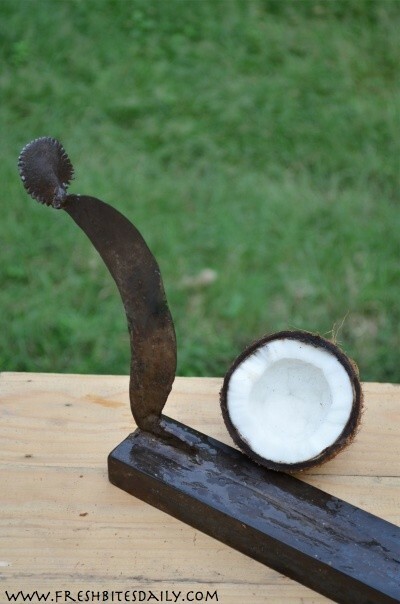 When we are ready to use the coconut, we use an instrument called a “koduval” to break it open. The coconut is usually kept in one hand and we use the koduval in the other hand to break the coconut in the middle. Usually we keep rotating the coconut in the hand, as we hit the coconut in the middle multiple times, so it breaks evenly into two. To read the method in writing, it sounds complicated and laborious, but in reality it takes a few seconds. Years back, I used to struggle to break the coconuts with my hands like I mentioned above, so I used to hit it over a stone, but the coconut used to break unevenly. I started trying the traditional method and now I can break the coconut in seconds perfectly. With regular practice, anyone can break the coconuts perfectly into two. 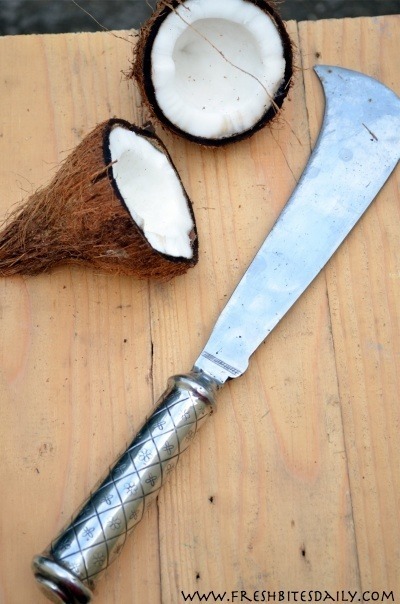 The coconut breaking instrument also should be sharp for easier breaking. Though our farm workers are very experienced in selecting the best coconuts, sometimes the coconuts do get spoiled. The best way to check for the quality of the coconut is by smelling the flesh. If it smells weird, then it is spoiled. It also must be pure white. Try to buy organic coconut that is not very dry. If it is spoiled, discard it safely — if you have pets, they are usually drawn to the smell and end up eating it and getting an upset stomach. Don’t not waste the coconut water — you can use it for many things. I will give recipes for making healthy drinks with it in the future. Try to break the coconut over a wide pan to collect the coconut water. The coconut water that is collected will not be very tasty like the coconut water you get from young coconuts, but still it can be used for many things. The next part is scraping the coconut flesh out of the coconut. Traditionally, we use a special instrument to scrape the coconut (pictured here at right). Nowadays, the coconut scrapers come as an attachment in most of our grinders, just like citrus juicers. Just press the coconut firmly onto the coconut scraper and it scrapes the coconut within a few seconds. While scraping, make sure to stop before the scraper reaches the very end of the fleshy portion, or else the scrapings will be filled with coconut fibers. If we scrape to the end, the color of the coconut milk will also be discolored because of it. Once you have the coconut flesh separated from the shell, I always like to grind the coconut scrapings with plain water to make a coarse paste for extracting the milk. If you grind the coconut too finely, you will not be able to squeeze the coconut to extract the milk. Many people like to add hot water to the scrapings, wait for a few minutes, and then squeeze the coconut milk, but this method does not extract the coconut milk fully. Always use the mixer for extracting the coconut milk and then use a fine strainer to squeeze and strain the coconut milk. Again if you don’t use a fine strainer, the coconut milk will not be smooth. Now your coconut milk is ready to be used! Remove the coconut flesh from the coconut. Add enough water to grind the coconut into a coarse paste. Grind the coconut and water in a mixer or strong blender. Strain the liquid portion of the paste through a fine strainer or cheesecloth to separate the liquid from the coconut solids. Coconut milk is best used the same day it is made and does not store well, but you can pour it in a glass bottle and refrigerate for a day. If you refrigerate the coconut milk, you will find that the next day, the coconut milk is separated. Please don’t think it is spoiled, just mix it with a spoon and it will be ready to use. However, do not try to store it for more than a day because it will surely spoil. When you are cooking with coconut milk, make sure not to cook the gravy too long after adding the coconut milk. If the gravy or sauce uses only coconut milk as the main ingredient, try to cook it in low flame with constant stirring else it will curdle. If you are using it raw in milk shakes and ice creams, try extracting thicker milk by adding very little water to the coconut scrapings. 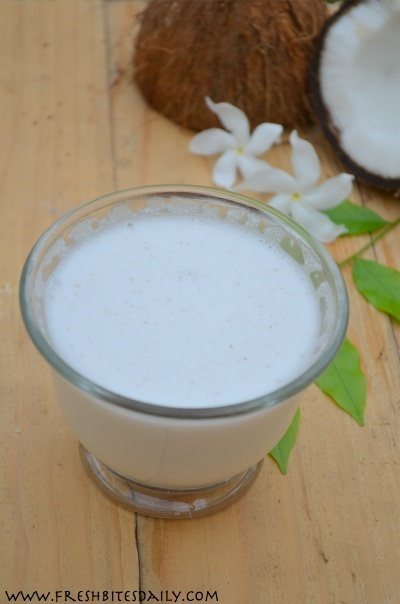 There is a lot of difference in taste, nutrient value between tinned coconut milk and fresh coconut milk, so always try to make your coconut milk for best results.